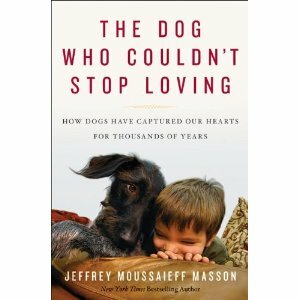 THE DOG WHO COULDN’T STOP LOVING by Jeffrey Moussaieff Masson hit stores this Tuesday October 5th, 2010 and it’s being marketed in a cleverly adorable way. If you are an animal lover like me, than you probably spend way too much time online looking and pictures and videos of cute animals. Harper Books is reaching out to this demo with this cute book trailer featuring some really cute pics and videos of dogs (the little brindle one is especially heart warming). Jeffrey Moussaieff Masson has long been interested in the relationships between humans and animals, and he’s always been aware that there was something very special in our bond with dogs. No other animals love us in quite the same way as dogs love us. And it is mutual. Is it possible that we developed our capacity for love, sympathy, empathy, and compassion because of our long association with dogs? In The Dog Who Couldn’t Stop Loving, Masson considers the far-reaching consequences of the coevolution of dogs and humans, drawing upon recent scientific research. Over the past forty thousand years a collective domestication has occurred that brings us to where we are today—humans have formed intense bonds with dogs, and the adoration is almost always reciprocal. Masson himself has experienced a profound bond with his new dog, Benjy, a failed guide dog for the blind, who possesses an abundance of uninhibited love. Masson knows that the love he feels for Benjy—the same feeling Benjy has for all the people and animals around him—is not unique, but exemplifies a love affair unmatched in the animal world. With wisdom, insight, and a brilliant analysis of recent scientific findings, bestselling author Jeffrey Moussaieff Masson delivers a provocative and compelling book that will change the way we think about love and our canine companions.